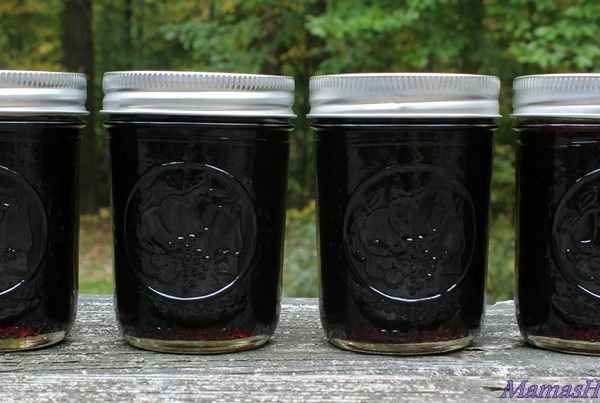 Preparing jars and lids for canning is a very important step in the canning process. First, examine your jars for any defects, nicks, cracks, unevenness, etc. This is an important step, any flaws in your canning jars may cause failure in the canning process. If no flaws are are present, wash your jars (old or new) in hot, soapy water and rinse thoroughly, or run them through the dishwasher. Tip: Do not use anything abrasive on your jars as this may damage the glass. Before filling your jars, they need to be heated (for 10 minutes), so they don’t break during processing. Place jars in a pan with enough water to cover the tops of them. Bring the water to a simmer (180 degrees) on your stove top, keep jars in the simmering water until they are ready to be used. Remove the jars from the simmering water, one at a time, as you are ready to fill them. New to canning? You might also want to check out Getting Ready to Can. 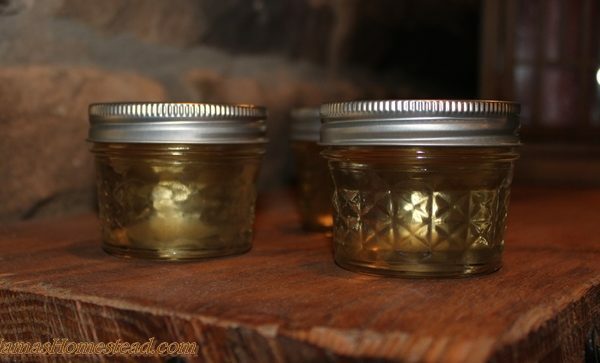 Choose the appropriate sized lids and bands for the jars you will be using. Inspect them for defects and damage. Important: Be sure to use only new lids each time you can, the rings are reusable. Wash lids and bands in hot, soapy water, then rinse in hot water. Dry Bands. Set lids aside to be heated. 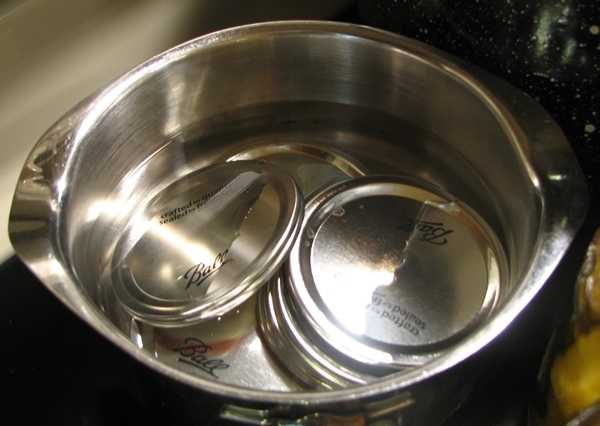 Before using your lids, they must be heated for 10 minutes. This helps the lids to seal properly. Place lids in a sauce pan, and fill with water to cover. Heat water to 180 degrees (do not boil). Keep the lids heated until you are ready to use them. 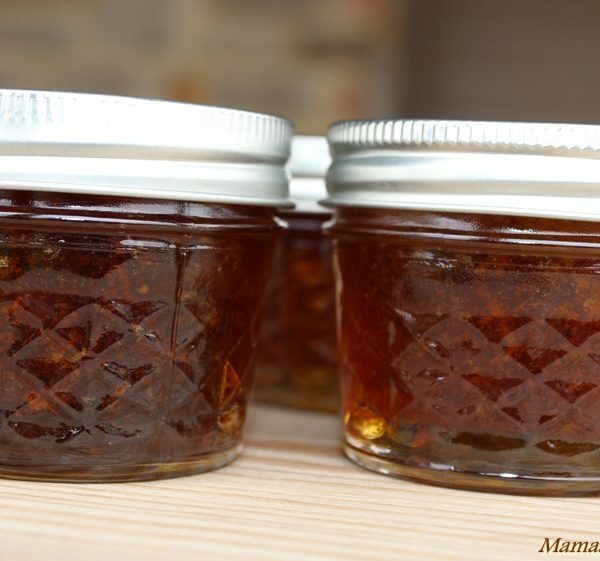 For more information on home canning, go to National Center for Home Food Preservation. Any questions? Let me know in the comments below, or send me an email. Can’t wait to hear from you! I miss those days, Tess! 🙂 I still love canning. What if I heat the lids in simmering water but haven’t made enough jam to fill all the jars and lids I heated? Is it safe to reuse these lids? Or is that considered ‘used’ and I need to discard even though I never tried to form a seal? 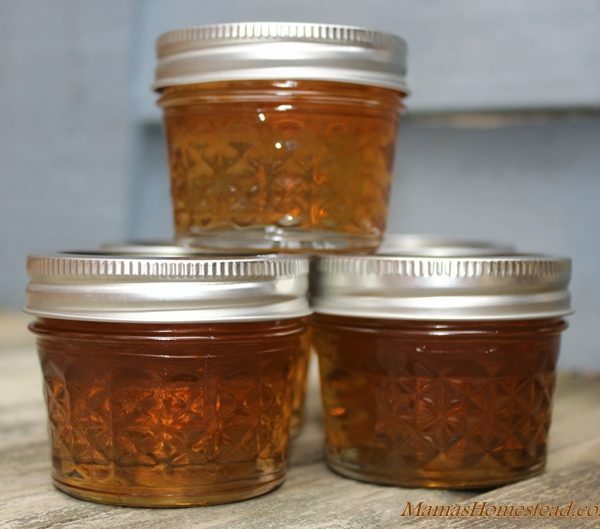 As long as you have not heated the lids to boiling or formed a seal with them, no, they are not considered ‘used’ and you can use them for canning. Hi, I haven’t canned for over 40 years, and I am trying to get this straight. The Ball book says 4 inches of water in the bottom of the pan, but yet cover with water. I am trying to get that clearly. I see some pictures of covering the jars to warm them, to 180, then take out the jars to fill them, then put them back in again to do the actual canning, is that right? I see to keep jars warm with towel or dishwasher, no dishwasher, what if I fill slow until I get use to it again? Then warm lids to 180 also. I’ve got everything else figured out and remember a lot of that, it’s just this 4 inches thing, but cover also, how do you do both? Maybe keep jars warm in 4 inches after simmering to 180? I do see both, 4 inches and simmer covered. ? . Thank you. I’m sorry, I was looking at the Ball book last night and got it mixed up with my canner instructions. The Ball book does say to put jars on the rack, and simmer for the 10 minutes, and then fill, and then put jars on the rack and then lower and boil, is that straightened out right? It says cover with one inch of water. Both times, when simmering and when boiling. So where does the 41/2 inches of water come into act, when you are keeping jars warm while filling them? I’ve canned everything there is to can before, but every time I start to can again, I have to get that straightened out. Thank you. Hi I heated my lids in a copper chef pan. Is this safe to do and if not do I have to throw the beautiful jam I just made away? Thanks! This is how I do it, but check with your County Extension Agent for approved methods in your area or search the National Center for Home Food Preservation for safe canning methods.